The growth of technology continues to disrupt, amaze, and influence society. The human race is fast approaching a huge catalytic technological disruption that will democratize knowledge and systems, potentially enabling people to live truly fulfilled lives. This is a point beyond which we cannot imagine how human civilization might actually look like because it is a moment of "Singularity" — but one group opposes this, an elite few who want to see a return to the dark ages of the early 2000s when they held all the power. Only the Agency stands in their way. You take on the role of Agency operatives, dedicated to keeping people safe in the future and enabling them to live their lives freely, surrounded by a sense of ease in this complex, constantly changing new world. The key lies in a few High Potential Individuals (HPIs). They have the ability to create a new technology called the MindNet that will move the world closer to "Singularity", but this also makes them targets. The Agency is responsible for ensuring the best possible outcome for society of the future by keeping these citizens safe. 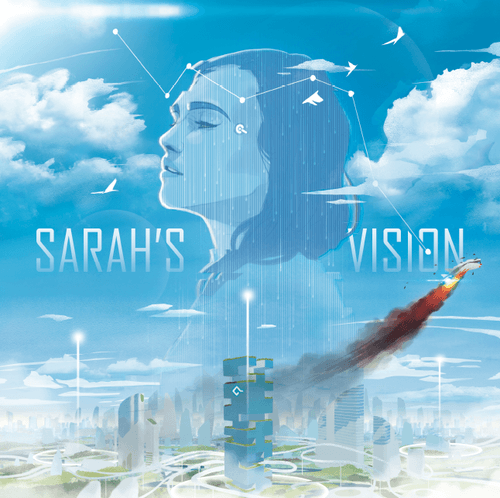 Sarah's Vision is a story-driven, co-operative game of strategy and resource management set in a world beyond imagination in which powerful forces seek to undermine society and return us to the dark days of the early 21st century. Players take on the role of Agency operatives and have to work through a series of story-driven events. At the end of each round, the leading event triggers and danger builds on three special citizens unless the players can find a way to keep them safe. Players have to choose wisely which Agency HQ Tower resources to use and when to use them if they are to succeed. The publisher notes that the game arrived in its warehouse in February 2019 and is currently being sent to a EU distributor, but with no U.S. distribution in place at this time. Sounds like a fascinating design, and the resources or actions appear to involve a Jenga-ish element in which you remove a block that bears stickers showing...something. • At GAMA Trade Show 2019, Red Raven Games' Ryan Laukat showed off the second edition of The Ancient World (video), which is due out in June 2019, but Laukat has also announced two new titles that bear a 2019 release date (although they might be Kickstarted in 2019 for release in 2020 — that's unclear right now). A great sleeping sickness has spread across the land, sending every type of creature to roam for hundreds of miles in a dazed, incoherent march. It’s your job to seek them out and wake them from their sleepwalk, recruiting them to help you find even more lost souls! 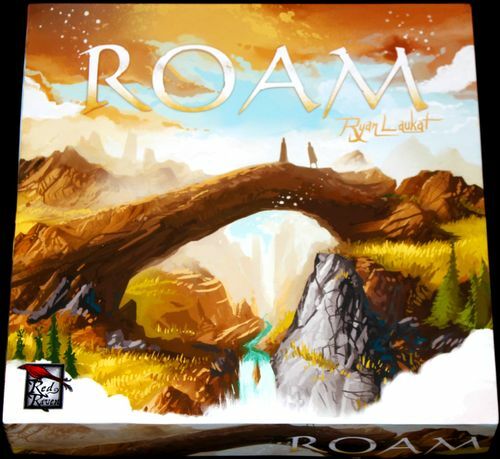 In Roam, you and up to three friends compete to find lost adventurers. There are over 50 unique, tarot-sized adventurer cards in the game, featuring characters from Near and Far, Above and Below, and Islebound. The opposite side of each card depicts a landscape split into six squares, and two rows of three of these cards are placed in the center of the playing area to make the board. Each turn, you may activate one of the adventurer cards in your party by flipping the card face down. Activating an adventurer allows you to place search tokens on the board in the shape depicted on your adventurer card. When every square on a landscape card has been searched, the player who did the most claims the card, finding the lost adventurer and adding them to their party. Each adventurer you add to your party gives you points and a new search pattern that you can use. When searching, you also claim coins, which can be spent to use special actions or purchase artifacts with useful powers. When one player has ten adventurers in their party, the game ends, and the player with the most points wins. "Are the stars unfamiliar here?" she asked, and the sky grew suddenly dark, the star's patterns alien and exotic. "This is the Wandering Sea. The gods have brought you here, and you must wake them if you wish to return home." In Sleeping Gods, you and a friend become Captain Sofi Odessa and her crew, lost in a strange world in 1929 on your steamship, the Manticore. You must work together to survive, exploring exotic islands, meeting new characters, and seeking out the totems of the gods so that you can return home. Sleeping Gods is a campaign game. Each session can last as long as you want. When you are ready to take a break, you mark your progress on a journey log sheet, making it easy to return to the same place in the game the next time you play. You can play solo or with a friend throughout your campaign. It's easy to swap players in and out at will. Your goal is to find at least fourteen totems hidden throughout the world. Like reading a book, you'll complete this journey one or two hours at a time, discovering new lands, stories, and challenges along the way. 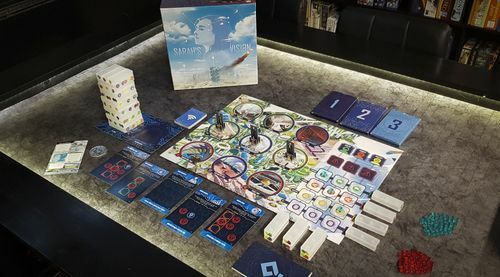 Sleeping Gods is an atlas game. Each page of the atlas represents only a small portion of the world you can explore. When you reach the edge of a page and you want to continue in the same direction, you simply turn to a new page and sail onward. 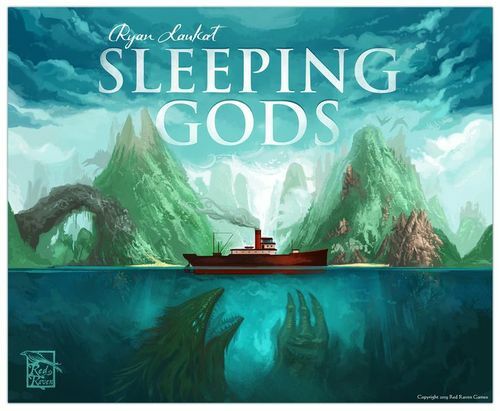 Sleeping Gods is a storybook game. Each new location holds wild adventure, hidden treasures, and vivid characters. Your choices affect the characters and the plot of the game, and may help or hinder your chances of getting home!